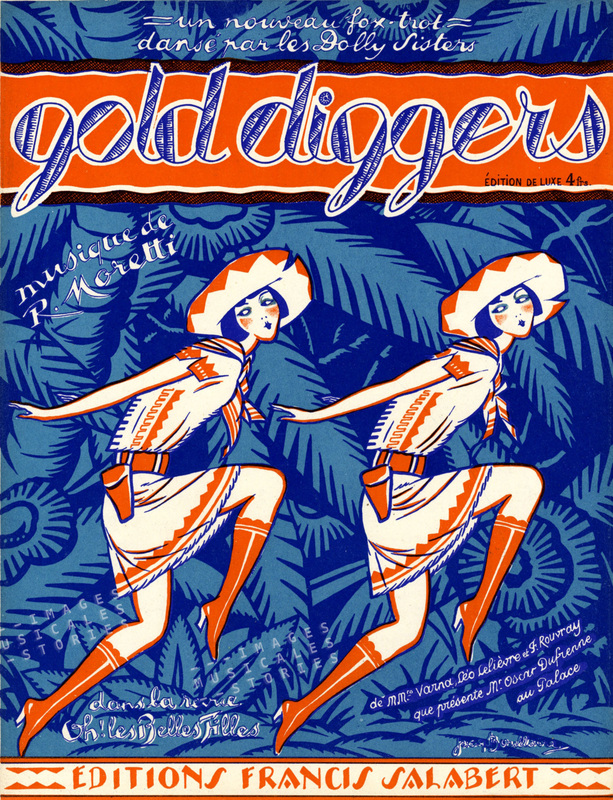 Gold Diggers is an appropriate title for the fox trot danced by the Dolly Sisters. They surely knew something about gold digging, not as in ‘gold mining in Klondike’ but as in sweet-talking sugar daddies. The Dolly Sisters were hot during the jazz age and everybody wanted to be seen with them, even royalty. Jenny and Rosie Deutsch had immigrated from their native Hungary to America where they began performing on stage at an early age. They were identical twins and they accentuated this by synchronising their movements and by wearing identical costumes. The Dolly Sisters soon became famous both in Europe and in the States. They had a penchant for plumes, jewellery, money, and older men but above all for gambling. 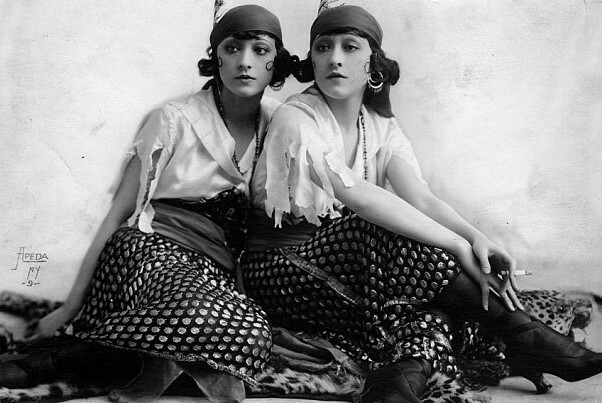 The Dolly Sisters in gypsy costume. The best known of their sugar daddies was Harry Selfridge, who founded the first ‘shopping is fun’ department store in Oxford Street, London: Selfridges. In his later life he became so besotted by the Dolly Sisters that he catered for their every wish. He bought them diamonds, flew over their favourite food and sat next to them at the gambling table, his wallet wide open. This would eventually hasten the downfall of Harry Selfridge: he lost his entire fortune and his beloved department store. The Dolly Sisters’ exuberant partying lifestyle came abruptly to an end when Jenny was injured in a car accident. She never recovered from it and sadly hanged herself in 1941. Rosie retired from public life and also tried to take her own live. She passed away in 1977. The Dolly Sisters were wildly famous during their heyday, but it was not an enduring fame. Now this is interesting. We still know Greta Garbo, Maurice Chevalier or Charlie Chaplin, but not the Dolly Sisters. Maybe long-lasting fame has to do with persistence and talent. The Dolly Sisters’ career span was rather short. As for their talent we can get a glimpse of that in a recently published YouTube fragment. They are performing in a pantomime of a traditional children’s tale Babes in the Woods, although not in their usual identical costumes. 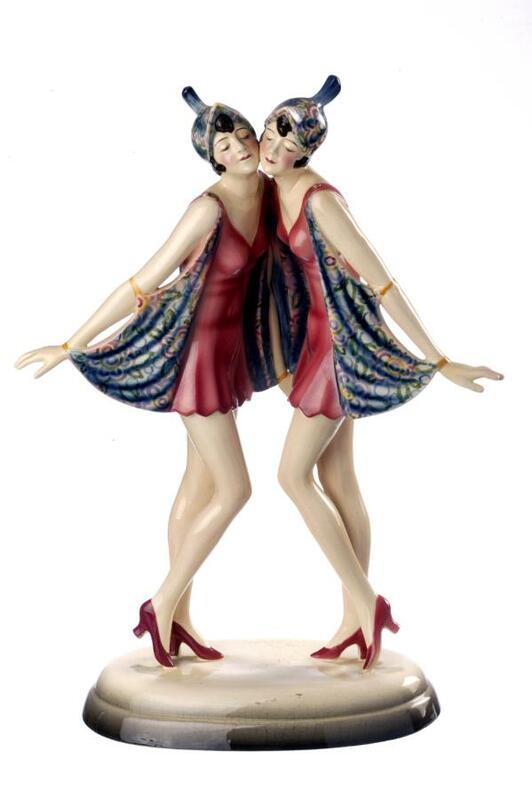 In an iconographic way the Dolly Sisters simply breathed Art Deco. 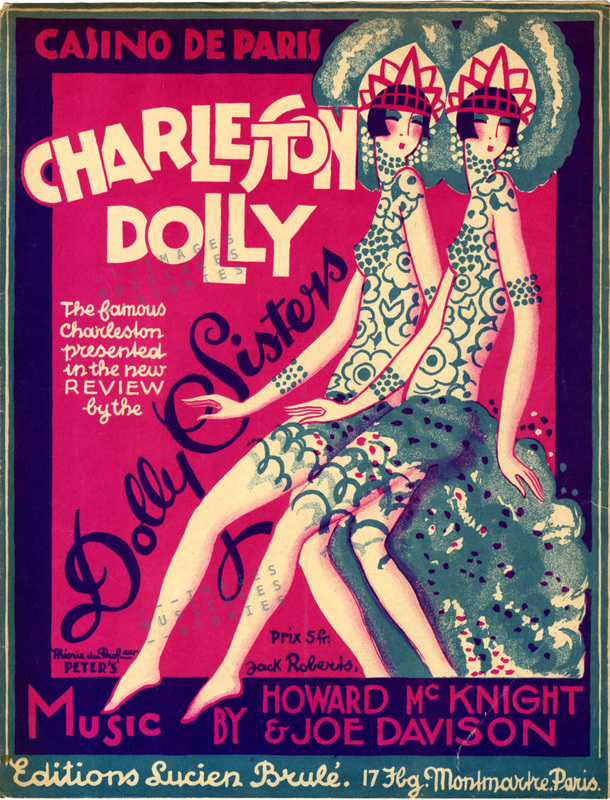 Their ornate costumes and lavish acts are the quintessential image of the Roaring Twenties as can be seen in some of our Dolly Sisters sheet music covers. 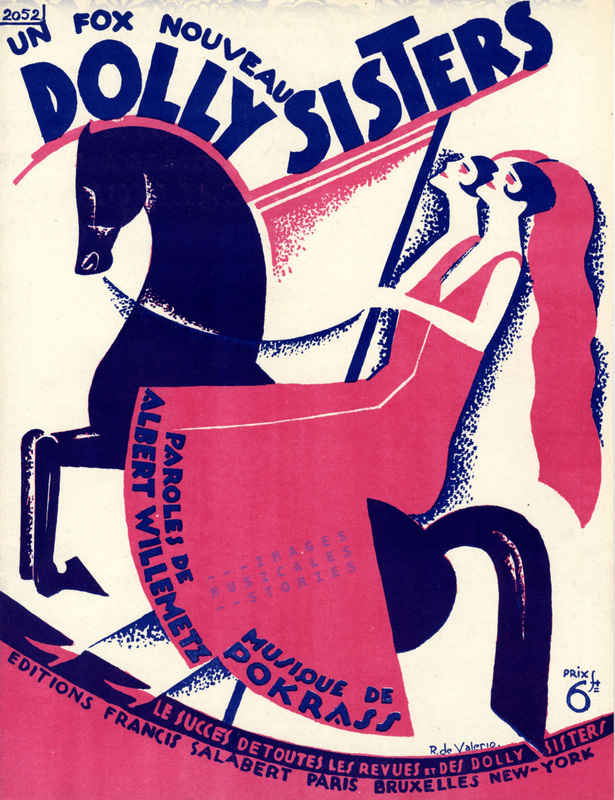 Three covers illustrated by Loris with Maurice Chevalier between Jenny and Rosie. 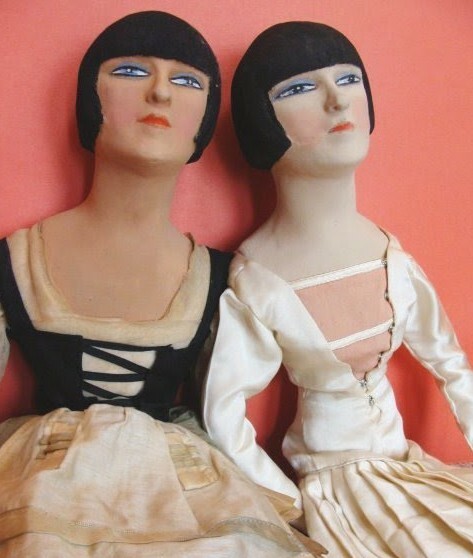 Furthermore statuettes, porcelain figurines and boudoir dolls accompanied the Dolly Sisters’ rage and success. 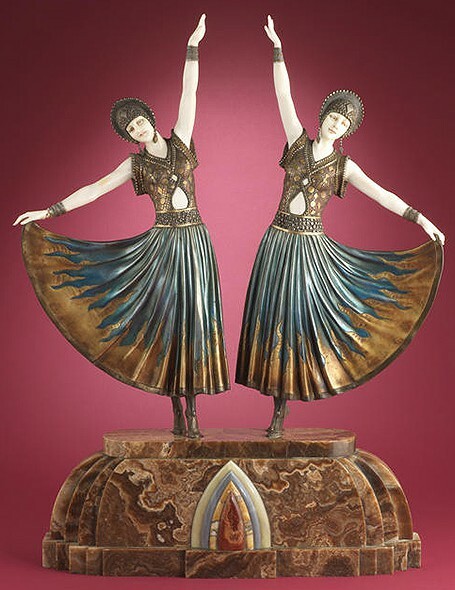 In 2012 a bronze and ivory statuette of the twins by Chiparus sold for almost 350.000 € . 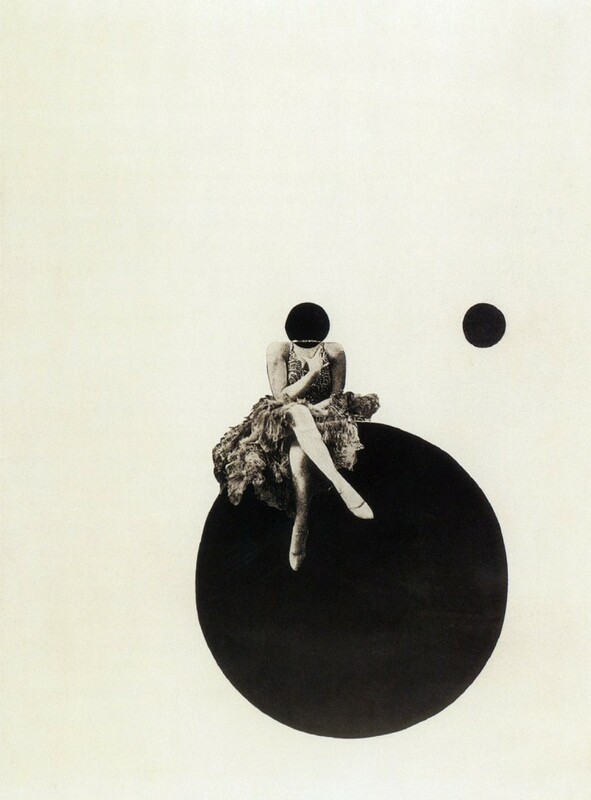 The twins also inspired László Moholy-Nagy for his modernist photomontage Olly & Dolly Sisters. Moholy-Nagy transforms their normally cheerful disposition by a vast emptiness using light, monochromatic colours and simple geometric shapes.